. At our practice, everyone is welcome. No matter your current state of dental health or feelings about your teeth, we are experts at helping move you, as our new patient, down the path to improved dental health, function, and esthetics. Comprehensive Evaluation—This is a detailed evaluation of teeth, gums, teeth alignment and jaw joint function. 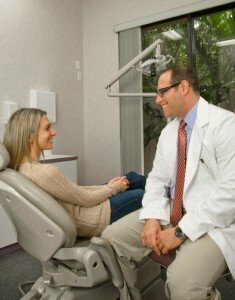 You are also screened for oral cancer, and time is reserved so we can have a meaningful conversation about your previous dental experiences, concerns, and goals. Treatment of Urgent Dental Concern—This is a focused examination and treatment to address a specific area of concern such as pain in a tooth, a broken tooth, inflamed gums, painful jaw muscles, or white lesions or stains on your teeth. Dental Cleaning, also called a “Dental Prophylaxis”—Many patients want to coordinate an initial cleaning with one of the other types of appointments listed here. Office Tour —Come tour our office and meet Dr. Alexander and his team with no obligations and no charge. Your first contact with our team will be a telephone conversation with Janice, our New Dental Patient Coordinator. Janice will discuss your motivation for contacting our office. She will help establish an initial visit based on your specific desires and needs. Our staff will ensure clarity regarding exactly what will be done in your first visit, how much time you plan on sharing with us, and what the financial obligation will be for that visit (if any). We know your time and personal finances are important. So we will always be clear about what to expect for each and every visit to our office. Our team looks forward to having the opportunity to help you love and enjoy your smile. Give us a call for a dental appointment in Delray or Boynton Beach — our office phone number is 561-732-8877. Dr. Alexander is dedicated to providing customized care to the discriminating needs of his patients. He offers options for your path to optimal dental health for a lifetime. Each patient is served on an individual basis with plenty of time for treatment and discussion of each visit to insure a comfortable, professional and personal relationships.